Deformities of the alar cartilage may be due to trauma, surgery, or congenital. Congenital deficiency of lower lateral cartilages is rarely observed; hence, lack of medial and/or lateral crus is extremely rare. A thorough examination with appropriate preoperative planning before definitive surgery is crucial for an upmost success. Here, a case having nasal tip asymmetry with lack of nasal tip support, hence, the atrophy of medial crus is presented. A 41-year-old female patient applied to our outpatient clinic for rhinoplasty. She did not have any antecedent trauma or surgery. Her medical history, condition, and laboratory were entirely uneventful. At the examination, the tip of the nose was asymmetrical, and the projection was insufficient. Slight droopy nose and a hanging columella were noted [Figure 1]a, [Figure 1]b, [Figure 1]c, [Figure 1]d. There was an S-shaped septal deviation; however, inner valve angles were over 15°, bilaterally. Informed consent of the patient was taken before surgery. The operation was carried out under general anesthesia. The open technique was used. Intraoperatively, the right middle crural cartilage was lacking [Figure 2]a. In order to provide type support and symmetry, cartilage graft from the septal cartilage was used to enforce the right middle crural cartilage. In addition, strut grafts were used to support the columella and tip of the nose [Figure 2]b. Hopefully, the intraoperative result showed a remarkable and satisfactory outcome, even immediately [Figure 2]c and [Figure 2]d.
The pre- and post-operative markings were made through a computer program from the radix to the tip of the nose (a), from the tip of the nose to the alar groove (b), from the radix to the most inferior point of columella (c,) from the most anterior point of the nostril to the alar groove (d), and from the most posterior point of the nostril to the alar groove (e) at the lateral side view [Figure 3]. The ratio of A/B, A/C, B/D, B/E was calculated pre- and post-operatively. The comparisons were made among pre- and post-operative values. In addition, nasofrontal and nasolabial angles were measured pre- and post-operatively. Postoperative ratios were significantly improved when compared to the preoperative equivalents. Preoperative nasofrontal and nasolabial angles were at 150° and 72° as well as postoperative values at 140° and 96°, respectively. These angles were remarkably transposed to the desired values [Table 1]. Eventually, the patient was extremely satisfied from the outcome [Figure 1]e, [Figure 1]f, [Figure 1]g, [Figure 1]h.
Conventionally, the alar cartilages were divided into medial and lateral cartilages; however, it was not until 1987 where middle crus was described that linked to various aesthetic problems ensuring applicable reconstructions as well. Tebbetts emphasized the columellar breakpoint and the linkage between the medial and middle crus. Successful rhinoplasty depends on a thorough preoperative evaluation. Sometimes, additional imaging studies may help the practitioner think of possible problems in the airway and/or outer nasal frames. However, it is crucial to know and understand the embryological development and the relevant anatomical structures of the nose to define the deformities and ensure an appropriate solution. Thus, an ecstatic rhinoplasty relies on the nasal tip support and projection, adequate interconnections between upper and lower lateral cartilages as well as lateral crus of the lower lateral cartilages and medial crural attachments of the caudal septum. In addition, the well-constructed transition from each anatomical unit to another is crucial to reach an acceptable appearance and a functional recovery. 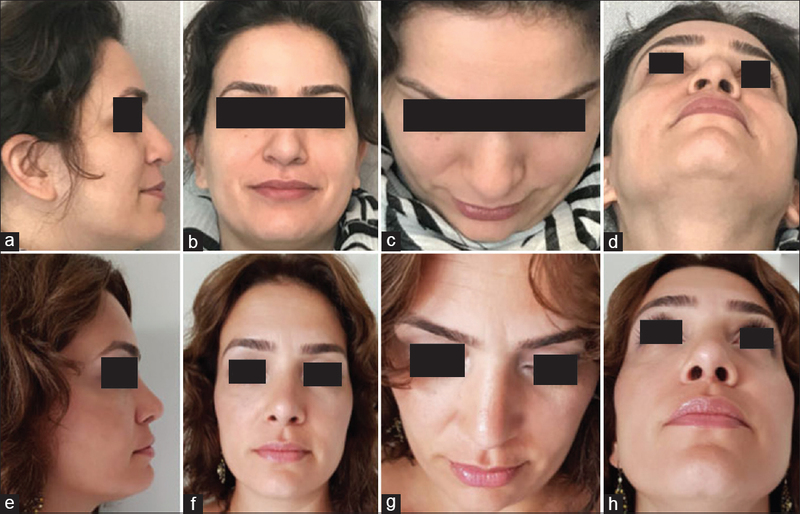 Laterally and anteriorly, ideal proportions between columella and ala of the nose were classified, and the discrepancies with the appropriate corrections were presented. It is important to maintain and/or establish the stabilization between the medial crus and caudal septum to prevent a ptotic, underprojected nasal tip, acute nasolabial angle, and/or retracted columella. The lateral crus plays an important function in defining the shape of the ala and providing support to the external nasal valve. The medial crus is composed of a footplate and a columellar segment and has an important function in nasal tip projection and support., Natvig et al. revealed three anatomical variations of the medial crura: Type 1 (asymmetric parallel – 75%), Type 2 (flared symmetric – 12.5%), and Type 3 (straight symmetric – 12.5%). The prevalence of nasal anomalies ranges from 1 in 20,000 to 40,000 live births. Losee et al. classified nasal anomalies into four categories such as hypoplasia and atrophy, hyperplasia and duplications, clefts, and neoplasms and vascular anomalies. Nasal cartilaginous deficiencies give arise from disruptions during the embryonic period when the nasal structures are specified. Embryonic cartilaginous fusion and growth occur with two facial prominences, the median nasal and lateral nasal prominences. The median nasal prominence gives rise to midline structures, including the vomer and nasal septum, the medial and inferior portions of the nostril, the philtrum, and the primary palate. Review of the literature revealed congenital deficiencies of the alar cartilages are very rare. Some deficiencies may be obvious at birth such as columellar absence and/or cleft notch of the alar rim, while some may be distinguished with time., In a single previous case report, an isolated congenital absence of the lateral crura was presented with a primary complaint of nasal obstruction. In another study, eight patients with medial crural deficiencies were presented with five patients as bilateral and three as unilateral. The only underlying anatomical problem had been tip or nostril asymmetry which was solved with cosmetic rhinoplasty. In this study, the medial crus deformities were comprised of four divisions, three gaps and one segmental loss. In our case report, unlike others, there was a complete loss of right medial crus of the lower lateral cartilage. Nasal tip surgery is considered a challenging operation. This is primarily due to the variable anatomy of the nose. The columella has been described as the “central scaffold on which adjacent structures retain support and balance.” For this reason, a columellar strut graft is often preferred to establish a support for the lower lateral cartilages., Surgeons must have a thorough knowledge about the entire anatomy of nasal cartilages and be aware of possible deformities, even faced surprisingly in the operative period, to deal with the deformities meticulously. Nevertheless, examination of the entire area and anticipation of possible deformities as well as appropriate planning preoperatively will ensure a planned outcome and overcome an unwilling result. Gunter JP. Anatomical observations of the lower lateral cartilages. Arch Otolaryngol 1969;89:599-601. Sheen JH, Sheen AP. Aesthetic Rhinoplasty. 2nd ed. St. Louis, MO: Mosby; 1987. Tebbetts JB. Primary Rhinoplasty: A New Approach to the Logic and Techniques. St. Louis, MO: Mosby; 1998. Patel KB, Mendonca DA, Skolnick G, Woo AS. 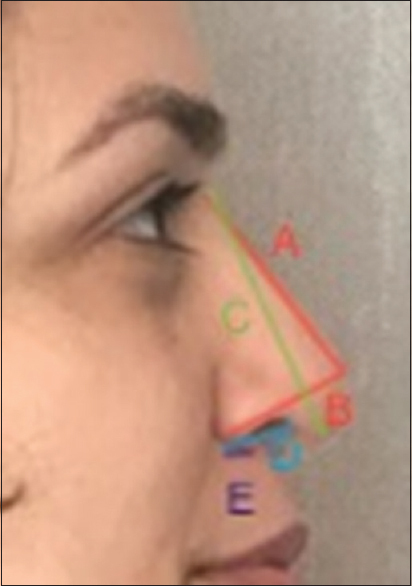 Anatomical study of the medial crura and the effect on nasal tip projection in open rhinoplasty. Plast Reconstr Surg 2013;132:787-93. Toriumi DM. Structure concept in nasal tip surgery. Oper Tech Plast Reconstr Surg 2000;7:175-86. Johnson CM Jr., Todumi DM. Open Structure Rhinoplasty. Philadelphia, PA: Saunders; 1990. Oneal RM, Beil RJ. Surgical anatomy of the nose. Clin Plast Surg 2010;37:191-211. Natvig P, Sether LA, Gingrass RP, Gardner WD. Anatomical details of the osseous-cartilaginous framework of the nose. Plast Reconstr Surg 1971;48:528-32. Losee JE, Kirschner RE, Whitaker LA, Bartlett SP. Congenital nasal anomalies: A classification scheme. Plast Reconstr Surg 2004;113:676-89. Jacobs KF. Congenital aplasia of the nasal columella and cartilaginous septum. Laryngol Rhinol Otol (Stuttg) 1984;63:344-6. Lewin ML. Congenital absence of the nasal columella. Cleft Palate J 1988;25:58-63. Adelson RT, Karimi K, Herrero N. Isolated congenital absence of the left lower lateral cartilage. Otolaryngol Head Neck Surg 2008;138:793-4. Kosins AM, Daniel RK, Sajjadian A, Helms J. Rhinoplasty: Congenital deficiencies of the alar cartilage. Aesthet Surg J 2013;33:799-808. Rohrich RJ, Kurkjian TJ, Hoxworth RE, Stephan PJ, Mojallal A. 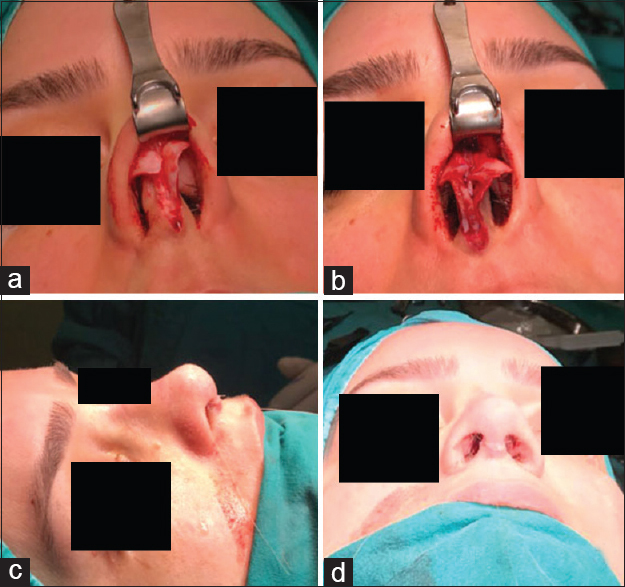 The effect of the columellar strut graft on nasal tip position in primary rhinoplasty. Plast Reconstr Surg 2012;130:926-32.